Behavior changes can be hard in a classroom full of kids, but as a music teacher, I have found that having set routines really help, and endorsing the help of students can also be a great strategy. Older kids who can read simple instructions can be called on to give directions or lead musical activities. When I taught early childhood music at a school in Dallas, I had a routine of using my recorder and playing or singing "Hey Betty Martin" when I got children from their classroom. I changed the words to "hey all you children, walk with me". I also used "oh come and make a circle" etc. When I did get really sick, I realized that all I had to do was play all these instructional songs on my recorder and the kids just did it! It really saved me. ECM instructors Cheryl Henningsgaard, Aric Bieganek, Julia Waletzko, and Nora Paoli also had some great ideas for preventative health, self-care, and classroom practices and routines. 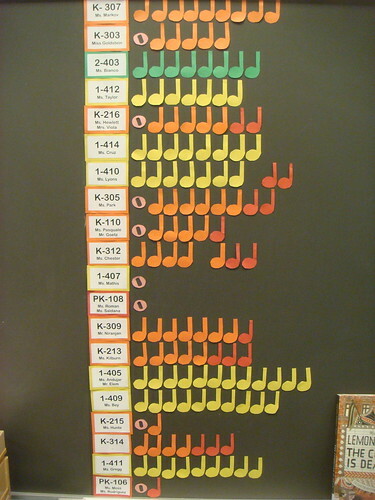 Many of the songs from the two ECM CD's can be used during a class, along with instrument exploration and activities such as instrument of the day, parachute, ribbon wands, and rhythm sticks. I use the ECM Classroom CD's to supplement my singing (Someone Is Hiding, Clap Your Hands, Floating Down The River, The Duo Song). I also play the piano and the guitar, encouraging the adults to provide the "live singing" for the class. If I am running a temperature, I do stay home." Get an adequate amount of rest each evening (6-8 hrs), especially when you're not sick; Exercise frequently (especially core muscle exercises, so much of singing is breathing, and when your voice starts to get tired, much of it is from lazy/labored breathing); Speak in a head voice." "Throat Coat tea by Traditional Medicinals - it feels SO good on the throat. I love the taste, but it seems that people either love it or hate it. The other suggestion is talking on pitch rather than "singing". However, sometimes when I'm sick, it feels better to actually sing in a light head voice than to speak, so I'd take that on a case-by-case basis." Use recorded music movement songs that tell students how to move, such as "Sambalele"
Put on fun music and have everyone blow bubbles for a "bubble party"
"Glue dancing:” Pick one body part, everybody has to dance with that glued to the floor. Then stop music and choose a different body part, ask students/families for ideas, etc. This is great for older kids. In parent-child classes I often play some of the same songs on the piano every week during parachute time. Then if I lose my voice, I can just play the piano part and the parents still know what to do, when to shake, when to walk in a circle, etc. Also with the parachute: bounce a monkey or other fun stuffed animal on the parachute to recorded music. Then do the chant "One potato, two potato." but instead say, "one monkey, two monkey..." and all toss the monkey up on the word "more! A few weeks ago, I had the opportunity to put many of these strategies to work as an unusually fierce virus clobbered my larynx. In particular, I found it extremely helpful to rest my voice whenever possible as Jennifer suggests. I also avoided all medicine with antihistamines and drank plenty of fluids. In the classroom, I did make use of the recorder, the piano, chanting, and established classroom routines. I look forward to having an even better arsenal of strategies the next time my voice is affected by illness. Thanks, ECM colleagues!